Marriage is a lifelong relationship. But in today’s fast changing world where marriages, which were earlier believed to be made by God, are being broken the very first day and the brides are committing suicides or are killed for dowry etc., this concept of pre-matrimonial verification has gained significance. Often parents of prospective brides and grooms like to know about the whereabouts of their child’s would be spouse. 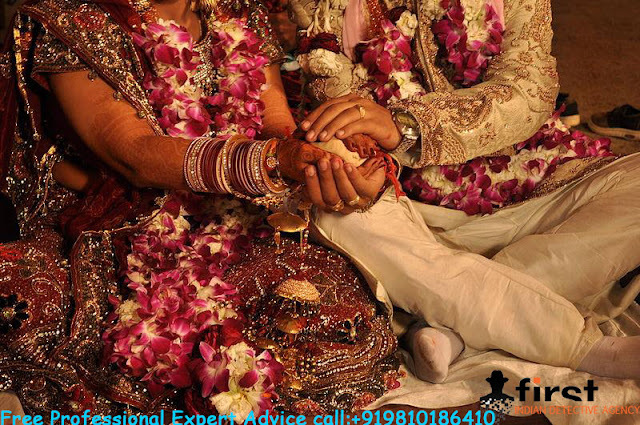 We offer Pre-matrimonial investigative services, which if done honestly and carefully. However, in the process we ensure that our client’s interests are upheld and safeguarded. We maintain total confidentiality during the process. Revolution has captured the godliness of the institution of arranged marriages, unlike the earlier days when marriages were held usually within the known families. With the changed scenario, now marriages are being mostly arranged through unfamiliar sources such as websites and newspaper ads. We provide services for pre-marital verification. We not only confirm the details provided by the other party as well as we also provide with a detailed analysis of the prospective bride /groom. Financial Status:This has to be thoroughly and very confidentially checked to enable the client to get a clear picture of the expected living standard the alliance would bring about, rather than be disillusioned later, that may lead to a breakup. Employment / Business Details:Investigation necessitate one to probe deeply into prospective groom/ bride’s professional status, especially with high sounding designations for low-performing jobs as is in the vogue nowadays. In case the prospective spouse is in business we can ascertain the financial health of the business. Concealed previous Marriage / Divorce:Needless to say any secretion in this area has potential to create havoc in married life. But any such information if thrown up by a pre-marital investigation can save a lot of harassment later in life when confronted with lawsuit for alimony or maintenance of children living with the estranged spouse. Criminal Activity:Involvement in criminal activities is one aspect of a person that comes to the fore only after the deep probe. Money spent here is worth its weight in gold if any such nefarious activity is detected before tying the knot. Drug / Alcohol Abuse:Addiction to drugs / alcohol can be the source of major financial stress besides having the far reaching psychological impact on both the addict and partner. Knowledge of these addictions is a must prior to taking any decision about the marriage. Our scriptures have proclaimed that marriages are made in heaven, the Venus Detective expertise in pre-marital verification goes a long way in ensuring marriage remains that way.